611. How Cedar wants to wear his sunglasses to read National Geographic…just like Daddy wears his reading glasses. 612. Going shopping with my mom, sister and sister-in-law (and my littles!) and finding some new summer shirts. 613. How amazingly well Cedar and Genoa did during such a long shopping day. 614. Chocolate chip cookie dough. 615. Being needed by my little ones. 616. A quiet recovery day after shopping. 617. How organized Cedar’s toy area is after all his board books are in his new book basket. 618. Re-reading Stepping Heavenward and being so encouraged by it. 619. A late birthday gift package for Genoa and I. 620. Getting the invitation to Genoa’s baby shower. 621. A ballet counting book. 622. Diatomaceous earth (to take care of our ant problem). 623. Cedar barking in his sleep. 624. Beef, red pepper and quinoa stir-fry. 625. Cedar helping me cut up watermelon and put it in a bowl. 626. My new nursing cover made by my mom. 627. Little boy polo shirts. 628. My love randomly making me chocolate chip cookies. 629. A very encouraging report (at my midwife appointment since we don’t have a scale) in regard to my post-partum weight loss. 630. One of my best friend’s having a son! 631. Taking Cedar and Genoa to the zoo. 632. Watching Cedar walk all around the zoo and being so fascinated with all the animals (he didn’t want to leave the elephant exhibit as it was the first one and he didn’t know there were more animals). 633. How light and cool my Bali Breeze wrap is. 634. Genoa in her little pink and white sun hat. 635. Kisses at the kitchen sink. 636. Roadside lupine in a Mason jar. 638. A drainer emptied of clean dishes. 639. Breezes rusting through leaves. 640. My mom doing all the mending I haven’t gotten to yet…and rescuing one of my shirts that I thought was past repair. 642. Bags of fresh greens from my mom’s greenhouse. 644. Energy in spite of short nights. 645. Relaxing in bed with my little family on a Sunday morning. 646. An excellent and refreshing sermon. 647. Both kids behaving so well at the church service (it helped that we purposely arrived late so Cedar didn’t have sit still for the whole two hours). 648. The soft weight of a baby asleep on your chest. 649. Looking forward to having friends over for dinner. 650. Two quarts of dried morel mushrooms from my dad. 576. The first bubble bath in I don’t know how long…so needed. 577. How totally relaxed Genoa (sometimes) looks when she sleeps. 578. Being inside my cozy little cottage listening to the rain outside. 579. Reading books with Cedar. 580. Dainty long-fingered little hands. 581. Nursing Cedar while Genoa sleeps on my chest. 582. Cedar “tickling” me with his toy rake. 583. The encouragement from random songs that come up on my iTunes shuffle. 584. The memories from our courtship evoked by Sandra McCracken’s “All the Miles”. 585. Sending “scandalous” texts to my husband. 586. Getting out the next size range of little girl clothes. 587. Cedar finally turning the corner to walking more consistently. 588. Eggplant parmesan from the garden eggplant we froze this summer. 589. A restful day after a very wakeful night. 591. A daddy who uncomplainingly walked his baby girl to sleep at two in the morning. 592. A good supply of nursing pads. 593. Butter, peanut butter and Nutella on toast. 594. Aaron and Cedar on a father/son outing to get Cedar’s first big boy (hard-soled)shoes. 595. How Genoa sometimes throws her arm over her face when she’s really tired and nursing to sleep…just like her big brother used to. 596. My lilies-of-the-valley blooming for so long. 597. Surprise scones from a friend. 598. Reminding myself that Genoa eating every one and a half to two hours throughout the night is actually a good thing. 599. My amazing husband who got up with Cedar so that I could sleep in while Genoa was sleeping. 600. Forgiveness just a breath away. 601. The bittersweetness of seeing my little boy grow up. 602. Cuddling on the couch while we finish up Human Planet. 603. Sourdough chicken garlic calzones. 604. Lazy Sunday afternoons with my darling. 605. Cedar taking a three and a half hour nap and waking up in a good mood. 606. Getting a 70 point word in Scrabble (EQUATOR with the Q on a triple letter and the whole word on a double word) and therefore actually beating Aaron (but only by six points). 607. Trying out new diaper covers. 608. Looking forward to my mom and sister’s visit. 609. Calling Poison Control and finding out that the cutting fluid Cedar possibly ingested isn’t toxic. 610. How nursing provides needed breaks even when you didn’t think you needed them. The early morning hours of April 28th, 2011 found me yet again trying to sleep through contractions and not succeeding. I finally got up around three to try taking a warm shower since that had helped to slow/stop the contractions in the past weeks. This time it didn’t work and since the contractions were getting to be about five minutes apart, we decided to call Jenny (our midwife) at around four. She got here in about forty-five minutes and when she checked me, I was dilated about three centimeters. She called Jackie (the second midwife) to let her know that things weren’t super urgent, but we all still thought that I’d go pretty fast once I started active labour. Everybody started getting set up. Aaron’s mom, Cassie, came down and we started filling the birthing pool. The contractions were starting to get rather painful and I desperately wanted to get into the pool, but I knew that I should wait until active labour started or else I would risk the labour slowing down. I decided to try and rest a little bit so I laid down on the bed and moaned my way through a couple more contractions. Around seven, the contractions started getting farther apart and then stopped completely. I told Jenny (who had already figured it out due to the fact that I wasn’t moaning anymore) and she decided to leave all her stuff at our house and go hang out with Jackie at a local coffee shop for an hour or so and we were to call her if things picked up again. She encouraged me to try to sleep if I could as I hadn’t gotten any sleep the previous night. Disappointed that the contractions had yet again petered out, I went back to bed and thankfully was able to sleep for a couple hours. Aaron called Jenny and Jackie while I was sleeping to let them know that things were still quiet and as Jenny had several prenatals to do that morning, she was planning on continuing to go about her day and just told us to keep her informed. I got up around mid-morning, had some breakfast and then went and visited Cedar, who was spending the morning up at Aaron’s parent’s house (in order for me to rest and because all the birthing stuff was still out at our house). I came back down to our house and put away some of the towels and blankets and such. The birthing pool was still filled in the middle of our living room. We tried a couple things to get labour started again, but with no visible results (ironic since with Cedar’s birth we were doing everything to try to stop labour). Around mid-afternoon, I started having contractions again. They were very painful and intense, but about twenty minutes apart. They continued throughout the afternoon, sometimes getting closer together, but never more than ten minutes or so. I tried to distract myself from the pain through doing some online shopping with a gift certificate I had received for my birthday and watching part of “Babies” with Cedar. Cassie had invited us up to their house for dinner and we went, though I wasn’t a very good dinner guest as I tried to breathe through the contractions when they came every ten to fifteen minutes or so. As the evening progressed, the contractions continued…very painful, but still never closer together than ten minutes. I was exhausted from not sleeping the night before and from dealing with contractions for most of the day. As the contractions didn’t seem to be going anywhere and I desperately needed sleep, we tried several things to stop them, but nothing worked. Resigned and exhausted, Aaron and I went to bed and I tried to doze between contractions. They were so painful that I had to moan through each one, which I felt horrible about since I knew that it was keeping Aaron up too. After a couple hours, I couldn’t handle lying down any longer and I told Aaron that I was going to try taking another hot bath (one of the methods we had unsuccessfully tried earlier to get my labour to stop). The bath didn’t help much and at that point the contractions got to about five minutes apart so Aaron called Jenny and she left to come here. By now, the contractions were so painful and intense and I was so exhausted that I was seriously considering asking to go to the hospital and get an epidural because I didn’t think I could handle the pain anymore. I’m very pro-homebirth and don’t like any unnecessary interventions so the fact that I was even considering that was a big deal. I was sure that Jenny would get there and check me and I would still be a three or four. It was not a very fun time! As the bath obviously wasn’t helping, I got out and lay down in bed again, trying very hard to relax through the contractions. This was a lot more difficult than it had been with Cedar’s labour as I was so exhausted from lack of sleep. Keeping up a low-pitch moan and breathing through the contractions was my goal. Unfortunately, all the noise that I was making kept Cedar from sleeping very soundly that night and he was starting to get a little scared. Aaron was trying to drain the cold water from the birthing pool and fill it with warm, but he had to keep running back and forth between comforting Cedar and helping me through contractions. It got to the point where the only thing that even remotely helped the pain was Aaron rubbing my lower back hard through the contraction. Jenny got to our house around three and Cassie about twenty minutes before. In between contractions, Jenny checked me and I was dilated to about a nine. I was so incredibly relieved and it then made sense why I had been having so many “I can’t handle this any longer!” thoughts…I was going through transition! I could obviously get into the birthing pool at this point if I wanted to, but the contractions were coming right on top of each other and I wasn’t sure if I wanted to try to walk from our bedroom to the living room where the pool was. Thankfully, Aaron and Jenny knew that I did really want to birth in the water so they helped get to the pool. Getting into the pool helped so much in relaxing me and thankfully I got a several minute break from the contractions. This ended up working out really well since by now Cassie was trying to calm Cedar down and he was just losing it. Since I had a break from the contractions, Aaron was able to go and calm Cedar and then Cassie brought him up to her house where he spent a couple hours with Grandpa Donald. Once the contractions resumed, I felt a very strong urge to push and since Jenny figured I was fully dilated by then, she said it would be fine. With the first push, I felt the head descend and when I reached down, I could feel it. My water still hadn’t broken and therefore I couldn’t feel any hair yet. I pushed for about ten minutes, about four or five contractions (though I wasn’t counting!). I felt a pop as my water broke and about a minute later I finally pushed the head out. (The fact that my water broke only about a minute or so before Genoa was born was a huge blessing as I was positive for Group B Strep and didn’t have the antibiotic drip…therefore she was protected by the bag and her exposure to the GBS was extremely minimal. We’re so incredibly thankful for God’s protection in that!) One more hard push and she was out! It was 3:52 AM on April 29th, 2011…the due date! I drew her up out of the water and onto my chest. The midwives (Jackie had arrived about ten minutes before) were ready with warm towels and blankets and we dried her off. I discovered that she was a girl…something that both Aaron and I had thought all along. We spent about five or ten minutes in the tub and then Jenny wanted me to move to the bed to deliver the placenta. Once in bed, the midwives helped me get out of my wet camisole (the same one I wore for Cedar’s birth) and I dried off some. After being in bed for awhile, the midwives could tell the placenta had separated so I pushed it out. About a half hour after she was born, Genoa started nursing and continued for about a half hour (amazing for me since Cedar didn’t nurse until he was five days old). When she was finished, the midwives did her newborn exam and had me use the bathroom and get cleaned up some. Then they went into the living room and Aaron and I were left with our little girl. A couple hours after the birth, Donald brought Cedar back down and he met his new sister. He was in a remarkably good mood for having such a rough night and being up so early and he was fascinated by his little sister. We took some pictures and then Aaron put Cedar back to bed and everyone else left. We had two girl’s names picked out during the pregnancy and after she was born, we both agreed that she was definitely a Genoa. We went back and forth on the middle name some, but finally came back to our original choice for Genoa. Once that was decided for sure, we called both sets of grandparents to tell them her name…and then we all slept. This postpartum/newborn period has been amazing and such a night-and-day difference from all the stresses of the first weeks after Cedar was born. Genoa loves nursing and is such a natural at it. Thankfully, she didn’t have any problems with jaundice either and gained back her birth weight by the time she was six days old! We’re so amazingly grateful to our Father for this precious gift. 531. Lying snuggled in my love’s arms as we talk much too late into the night about anything and everything. 532. Genoa’s own aden+ anais blankets. 533. Our first family trip to town going so well. 535. Genoa in her little dresses. 536. My Mother’s Day gift: a jewelry tree. 537. Chocolate from World Market. 538. Kettle Backyard Barbeque potato chips. 539. Watching my husband work…so strong and handsome. 540. How Genoa loves being worn so much. 541. Reading We’re Going on a Bear Hunt for the umpteenth time. 542. How little boys know how to make car noises with being told. 543. Genoa sleeping on her daddy’s chest. 545. All the little noises sleeping infants make. 546. An abundant breastmilk supply. 547. My sister-in-law coming down for lunch. 548. The scent of falling dew. 549. The planned power outage only lasting a couple hours. 550. The startings of Genoa’s double chin. 551. Cedar emptying his toy box and “discovering” so many new things. 552. A day with no laundry. 553. Evenings with my love. 554. Being able to wear non-maternity clothes again. 555. The riches of being mommy to two. 556. Cedar’s fascination with Genoa’s toes. 558. Spending the evening with old friends and meeting new ones. 559. A friend’s amazing Mexican rice. 560. Having a friend to talk to while we both nurse our babies at a birthday party. 561. My two little ones sleeping so well on a long late car ride home. 562. Both kids letting us sleep in on a Sunday morning. 563. My love making a yummy breakfast of apple muffins and scrambled eggs. 564. A relaxing day enjoying time together as our little family. 565. An amazing dinner, brought by friends, of kebabs on rosemary skewers, super yummy couscous, and parmesan herb foccacia. 566. A family walk on a cool but sunny evening. 567. Cedar trying to share his toys with Genoa. 568. The garden (hopefully) surviving an unexpected cold spell. 569. Trader Joe’s Sea Salt and Turbinado Sugar Dark Chocolate Almonds. 570. An evening with my darling of massages and talking about so many things. 571. How Cedar loves using his own fork and spoon. 572. The soft weight of a baby asleep on your chest. 573. A huge package from my uncle of natural goodies for the kids and I. 574. A husband who makes me spend my birthday money. 501. Being able to be up and about again. 502. Genoa in the Sleepy Wrap. 503. Dark and silky newborn hair. 504. Strauss Family Creamery organic chocolate ice cream. 506. Hour-long night-time nursing sessions. 507. Being able to talk through hard times with my love. 508. My first morning alone with both kids going so well. 509. A good one-week postpartum midwife appointment. 510. Genoa already gaining back all her birthweight. 511. Finding some cute girly warm-weather newborn clothes. 512. Cedar wiping down his place at the table. 513. My little guy loving nursing so much. 514. Folding tiny clothes in the laundry. 515. Watching my love and his little girl. 516. Successfully nursing Cedar and Genoa simultaneously with no help. 517. Cedar trying to hold Genoa’s hand while they were nursing together. 518. Cedar helping Aaron and I wash the van. 519. Learning anew how amazing it is to be a mommy. 520. A sweet Mother’s Day card from my darling. 521. The scent of infant breath. 523. Burlap shopping bags from my sister. 524. The generosity of so many people in bringing us meals. 525. New sidewalks and asphalt for part of our front yard. 526. Cedar “talking” more and more. 527. The face Cedar makes when he thinks something is disgusting. 530. Learning to daily treasure each fleeting moment of motherhood and enjoy them instead of focusing on all that I think “needs” to be done. 456. Mushroom, chicken and rice casserole. 457. Our Human Planet DVDs coming a day early. 459. Cedar graduating to the next soft shoe size. 460. Watching the first Human Planet episode while soaking in the bathtub with Aaron sitting on the bathroom floor. 461. Yet again having to learn to trust the good Father after another day full of contractions that just petered out. 462. Sunshine on my birthday. 463. Cedar’s fascination with dust motes dancing in the sunlight. 464. My mother-in-law picking up groceries for me. 465. Going out for pizza for my birthday lunch. 466. A little pre-dinner walk in lovely weather. 467. A yummy (and beautiful) swarma dinner from Aaron’s family. 468. Birthday cookies made by my love. 469. Watching Babies with Cedar. 471. Gracious midwives who don’t mind two early mornings in a row. 472. Meals from and at Aaron’s parent’s house. 473. An amazing husband who uncomplainingly juggled filling the birthing pool, calming Cedar and rubbing my back during contractions. 474. Finding that I was 9 cm dilated when I thought I was still a 3 or 4. 475. Discovering yet again that when you thought you couldn’t handle the pain anymore, that’s when you’re almost there. 476. A decisive husband and midwives who made me get in the pool when I was so out of it that I wasn’t sure. 477. Only twelve minutes of pushing. 478. The bag of waters being intact until about a minute before the birth. 479. Feeling the head finally come out. 480. Our precious little Genoa Leanne. 481. The moment of “It’s a girl!”. 483. The peacefulness of seeing that the baby is alright. 484. Sitting in my bed, with my husband beside me, holding my little girl. 485. Cedar meeting his little sister for the first time. 486. Genoa nursing for about a half hour after her birth. 487. The peace and quiet after everyone left and we all slept. 489. Pink and flowered baby clothes. 491. The scent of a new head. 492. Grace to get through the fears of the first night. 493. What an amazing nurser Genoa is. 494. Close friends bringing Papa Murphy’s…continuing the postpartum tradition. 495. Everything looking good at the three-day midwife appointment. 496. Being past the critical point for the possibility of a Group B Strep infection. 498. A husband who supposedly just went to the store for on-sale mangoes and came back with all sorts of food I like and a miniature red rosebush. 499. 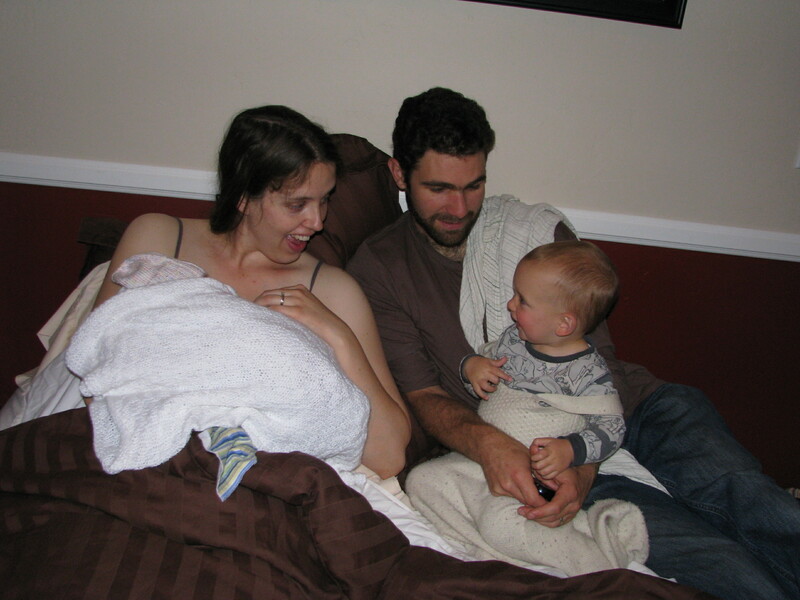 The same amazing husband who took care of all of us for my midwife-instated three-day bed-rest. 500. My wonderful little family of four. Today is usually the day that I post my gift list from the past week, but this past weekend I kind of fell behind on recording my gifts in my journal…so I hope to catch up on that today and post the list tomorrow. But I had a good excuse for falling behind because our little one finally arrived…on her due date! 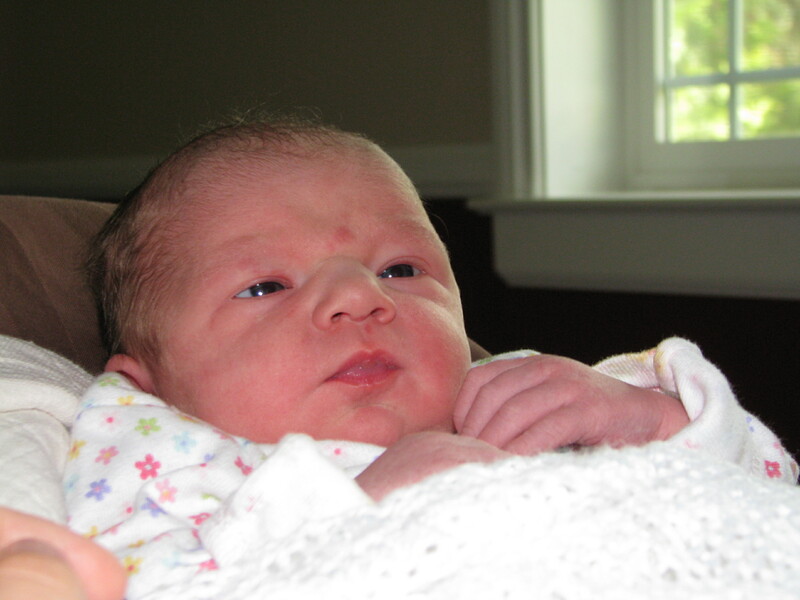 Our little Genoa Leanne was born in the water at home at 3:52 AM on April 29th, 2011. The labour was crazy and totally different from Cedar’s…but that story might be awhile in coming. She was 7 lbs., 7 oz. and 21 inches long. She’s been nursing so well and is such an easy baby. We love her so much! Cedar meeting his little sister for the first time.